Imagine your whole family making memories with their camping friends at a state park or favorite vacation destination. Everyone is having fun outdoors while you make meals on the outside pull-out kitchen and plan your week-long activities from kayaking, hiking, and swimming. This Minnie Plus also offers solid surface countertops, a pantry, and appliances inside if you prefer indoor cooking. There is plenty of seating and storage throughout, as well as sleeping accommodations. 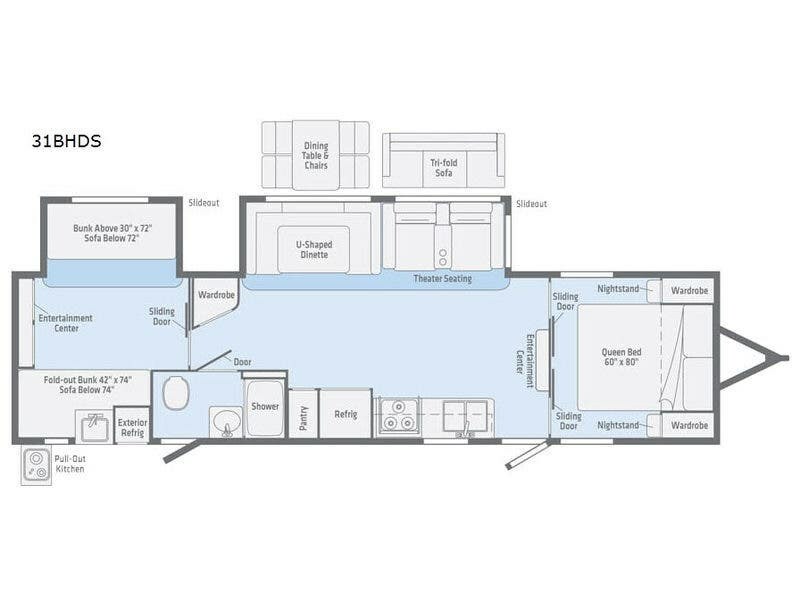 The kids will surely claim the private bunkhouse as their own with two sofas and two bunks, while you are on the opposite side of the trailer in the master bedroom. You will find many more standard features that make this the perfect trailer, or choose an option or two, the choice is yours. Check out Stock # 15628 - 2019 Winnebago Minnie Plus 31BHDS on winnebagorvsource.com!